Others study this book for their SATs, I hadn’t even heard of Chinua Achebe until I was 22. That doesn’t say anything good about me – except that I somehow have an excuse: African literature isn’t really big around here. 😀 Which also means that I have no way of placing this in any sort of context and that, while I did find it interesting and informative, I also found it unexpectedly alive and real. Unexpectedly for me, anyways. 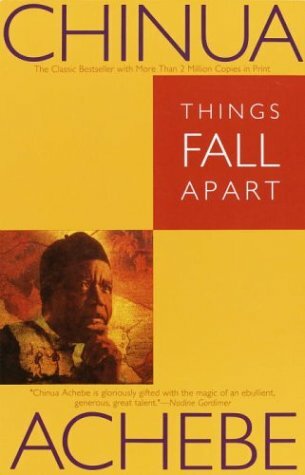 Chinua Achebe is, apparently, the father of modern African lit, and Things fall apart is one of the first African novels, written in English, to achieve global acclaim. The author was born in the village Ogidi, as part of the Igbo community in the southern Nigeria – and my reason for mentioning this is that it amazed me. I don’t know why exactly, but I pictured him as an expat, being born somewhere in the UK and returning to Nigeria for inspiration – as an adult. But he was born there, he lived there, most of what’s written in this book could be first hand experience (or stories told by elders) – and all this makes his achievements seem bigger to me, because it certainly took more willpower to get there than it would have taken…others (i.e. Europeans). The book itself is written very simply and yet very powerfully. The village of Umuofia comes alive so easily and, even if you don’t really understand many of the customs, you’re quickly caught in the story. Okonkwo is a sort of a self made man in his tribe, with an American-type of rags-to-riches rise set in a 100% African decor. The son of a poor and lazy man, he takes the decision to never be like his father, he works more than any other member of his tribe, he accumulates wealth (big yams crops, 3 wives, palm tree wine), titles and the respect of the clan, becoming one of its ruling members. He is powerful and very in control of his emotions – especially of those of love, be they for his family or for Ikemefuna, the boy brought as tribute and destined for sacrifice. Ikemefuna lives as part of Okonkwo’s family for 3 years, until the priests call for his sacrifice, and the man who gives the final blow is Okonkwo himself. His remorse is only brief – until it’s drowned by work and by his all-consuming ambition. A second defining moment for Okonkwo is his daughter’s sickness. Ezinma is, by far, his favorite child, judging by his constant regret that she wasn’t born a man. Perhaps in her clinging to life, in her ambition to live, he seems himself, just like, in his eldest son Nwoye, he sees traits of his much despised father. What derails Okonkwo’s life is his accidental shooting another clan member, and his subsequent exile to his mother’s village. Though he manages to become an important member of that clan too, after his 7 year punishment is over, he returns to Umuofia, only to find that everything has changed. White men have brought their religion and their priests, they have converted many locals (including his disappointing son Nwoye) and have completely changed the dynamic of the village. When one of the newly converted Christians unmasks one of the clan spirits during a ceremony (thus “killing” it), the church is destroyed and 6 of the clan leaders (including Okonkwo) are imprisoned (and humiliated, beaten) by the District Commissioner. Upon their return, Okonkwo demands war, and even commits a last act of defiance – defiance towards the new white law and towards his clan, who seeks a peaceful resolution, unworthy of their ancestors – and kills himself. There is a lot in the book about local customs – a lot which could seem barbaric to us, and which definitely seemed barbaric to those who first stepped foot in Africa. But when they are explained, when they are integrated in a community, when you see how they make sense and how they bring people together, you tend to forget their slightly more violent nature – like the legend of the Ogbanje (which actually impressed me most). In the end, Okonkwo’s fall is quick and symbolic for the fall of the entire continent – the old and new law can’t coexist peacefully, and it’s quite clear who will survive and who will fall. ~ by ameer on June 9, 2008. Very happy about this coincidence. Your post is sober-minded. End good, of course.